Our employees are what make Northern Engraving and our customers successful. They reflect our core values of Trust, Respect, Innovation, Service and Teamwork every day. It is their hard work and dedication to excellence that make a difference. One person who displays these values is Nancy Haney at the Sparta, WI location. 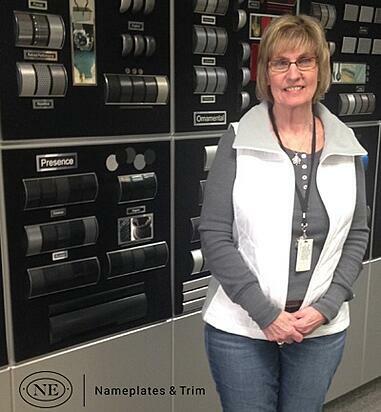 As one of the most long-term employees at the Sparta, WI location, Nancy has seen many changes. Starting out as a mail clerk in the file room and then moving into a secretary role, Nancy was able to use her organizational and typing skills. Back then the equipment consisted of manual type writers and Dictaphone machines. These skills were then put to more use as she moved into the scheduling area where she can be found today. “Scheduling can be challenging and our goal is to produce and ship parts in a timely manner. It takes patience to work through everything and you have to be willing to work together. By working together, the challenges quickly turn into rewards. I have always enjoyed the people I work with.